Comprehensive anti-virus security solution for your Windows PC. Real time protection. 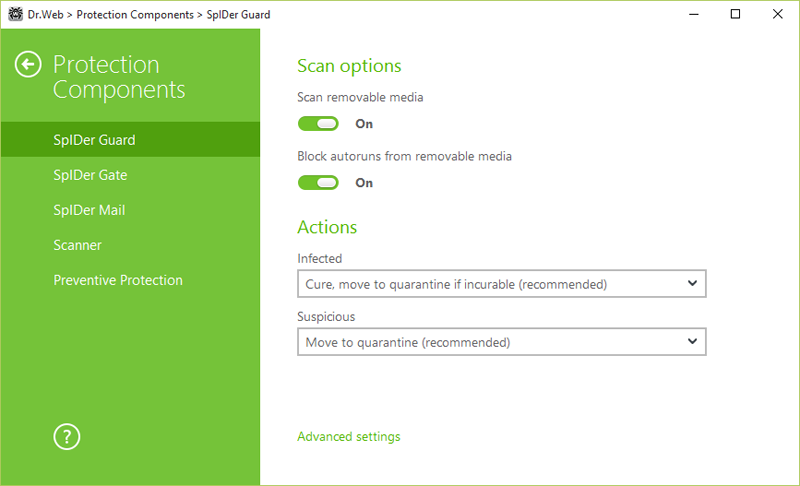 Installation and operation in an infected system and exceptional resistance to viruses. Efficient detection and neutralization of all types of threats. Fast multi-thread scanning powered by multi-core systems. Protection from latest malicious programs designed to bypass detection by traditional signature-based scan and heuristic analysis. Protection of data against corruption. Comprehensive analysis of packed threats. Scan of archived files at any nesting level. Best detection and neutralization of complex viruses. Filters spam and other types of unsolicited messages without training the anti-spam. Real time scanning of traffic on all ports. With secure search, Google, Yandex, Yahoo!, Bing and Rambler will only return links to content considered safe by the search engines – unsafe content is filtered out by the search engines! Secure communication – instant messenger traffic filtering. Efficient protection of children against exposure to objectionable content. Prevent unauthorized use of removable devices and the computer. Dr.Web Cloud – check URLs on Doctor Web’s servers. Protects against unauthorized access by a network; prevents data leaks; blocks suspicious connections on package and application layers. Remote administration from other computers in the local network without installing the Dr.Web Control Center.